At the beginning of the school year wife decided to obtain a class pet for her elementary classroom. The purpose was twofold, it would teach the students personal responsibility while being used as a form of positive reinforcement for acceptable behavior. 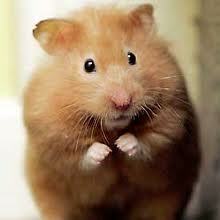 The hamster was christened “Max” by the children and brought laughter and merriment to all he encountered. Several weeks ago Max became afflicted with an unknown ailment and after checking with area veterinarians we discover that treatment would be $50-$75. If he was left untreated, the disease could prove to be fatal and he was in terrible shape. Respecting the deep sentimental bond the children had formed with the creature, we had only one choice: buy a similar replacement hamster for $13.95 and lie to the kids’ faces. Upon hearing this, she inhales dramatically, places her hands on her chest and in a volume much louder than necessary responds “Why did you have a hamster in the shower! ?” Sensing the judgmental eyes of several shoppers upon me, I decided to continue to the hamster section unaided. I was able to locate the Chinese-dwarf hamsters without a problem, and while they did resemble our beloved Max, they all seemed to have a disproportionately large set of testicles. This was going to be problematic since I doubted the children were going to miss the fact that Max had dropped a set of danglers over the weekend. I inquired if perhaps they had a female model since Max did not come with such prominent reproductive accessories. After engaging two other employees, they assured me that they do not sell female Chinese-dwarf hamsters. Equally emphatic, I assured them that the animal my wife procured from their establishment was not “ridin’ dirty” and therefore must have been either a female or a male with a birth defect. Remembering the cell phone video, I asked them if them if they could tell by looking at an image of one. Two of them agreed to try and I found myself huddled around my cell phone with two complete strangers while they said things like “Can you pause it and zoom in on the gonads?” I just prayed no one I knew was shopping there. Eventually, we engaged the store manager who suggested a different course of action. Apparently, when my wife acquired Max she had to sign a release (indicating that we would not sue if Max was carrying Bosnian elbow syndrome or some other exotic pathogen) and those forms were kept on file for a year. After several minutes of searching, she discovered the discrepancy. My wife had not purchased a Chinese-dwarf hamster as she believed, rather Max had been a Russian hamster. While he apparently was a male, the Russian variety is equipped with much smaller accoutrements than their Chinese counterpart. We then walked over to the holding cells and after comparing the floor models with the video of Max we found one who was similar. They placed him in a carryout container and I proceeded to the register to complete the transaction. While standing in line, a woman behind me tapped me on the shoulder and asked, “What’s in the box?” When I replied that it was a Russian hamster, she looked perplexed for a moment and then asked me what separated a Russian hamster from other hamsters. I told her my understanding was that all hamsters were separated by their ideological views on socialism and that I was unable to locate a capitalistic-sympathizer version. The conversation continued until I had explained to her why I, as a grown man, had spent a solid hour locating a specific breed of hamster. Once it was my turn to check-out, I was asked if I had any questions and I told the employee that I needed to spray paint the animal to better match his processor and was not sure if he needed a primer coat first. When this was met with dramatic gasps from shoppers behind me, I assured all of them that I fully intended to cover his tiny little nose during the process and he would be just fine.